Sherril, where's the square for "Very Helpful Bog Article"?? Especially "frankenpattern" ;) Tee-Hee! ; the double buttons ;) really cool, the lace patch that's looks intentional ;)!! Great fabrice once again. The colorful prints are my fave of course. IMO your top came out better than the inspiration top. I like the color and fabric better and it yours look more structured. The stacked buttons is a nice touch too. Cute top, and your creativity with the buttons is fantastic! Great idea. Great fabric makes for great garments. 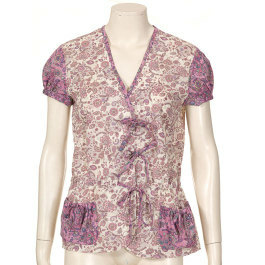 I really like the combinations in the paisley blouse. It is quite jacket like so would look great with a skirt or longer pants. That's a very pretty blouse. Perfect fit. Great fabrics too! Your new top is darling with great details. Have you lost weight? It sure looks it in this picture. Those prints could not be walked away from! Wow, are they nice! Can't wait to see what you come up with. 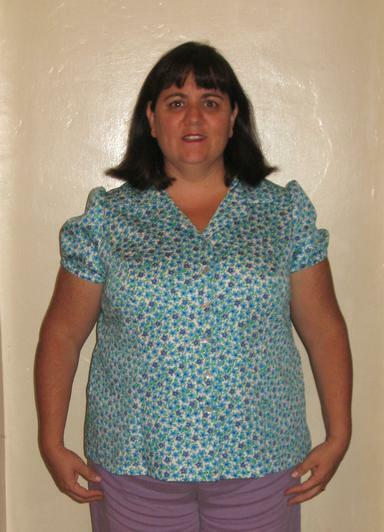 I love your tops and the buttons you used.